This article is taken from our Fields for the future guide which details our work at the pioneering Allerton Project farm. Click here to download this blueprint for farming, wildlife and the environment. 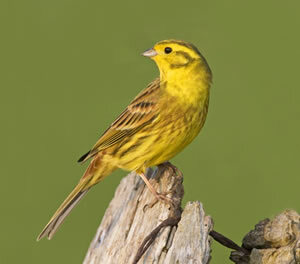 Lack of food in winter has been identified as a contributor to the national declines in numbers of some farmland birds. The observation that many farmland birds make use of game crops in winter prompted us to research the potential of this habitat as a conservation measure and develop it further aimed at those species that had suffered declines. We looked at the use of a large range of seed-bearing crops by a range of farmland birds and produced recommendations for the composition of seed mixtures that might be appropriate Countryside Stewardship habitat options. Since then, wild bird seed mixtures have been included as an option in agri-environment schemes. Our work showed that kale, quinoa and a cereal such as triticale or millet provided the best sources of food. These crops were advocated as an ‘intimate mixture’ by early Stewardship schemes, but our research showed that the crops were best grown as single species strips or blocks so that each could be managed according to their differing agronomic needs and seed production could be optimised to benefit birds. Early Stewardship scheme restrictions on fertiliser use also limited feeding potential for birds and our trials suggested an optimum rate of 60kg nitrogen per hectare (N/ha) (rather than the 30kg N/ha limit advocated within Stewardship). 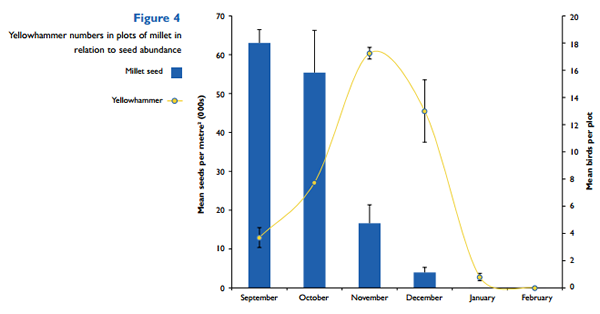 Our research also showed that different crop species retained their seed for differing periods through the winter. By January, teasel seed supply was reduced by only 70% as only goldfinches were able to feed from this species, but for most crop species, seed had become completely exhausted. For these crops, the seed supply declines as bird numbers increase during the first half of the winter, and then bird numbers drop in response to the continuing decline in the supply of food (see Figure 4). Our recommendation is that wild bird seed mixtures are implemented in combination with supplementary feeding in the second half of the winter. Influenced by our long-term data from the Allerton Project, this became an option within Stewardship schemes in 2013 and farmers can be paid to feed their birds in this ‘hungry gap’ period. This article is taken from our Fields for the future guide which details our work at the pioneering Allerton Project farm. Click here to download this blueprint for farming, wildlife and the environment.